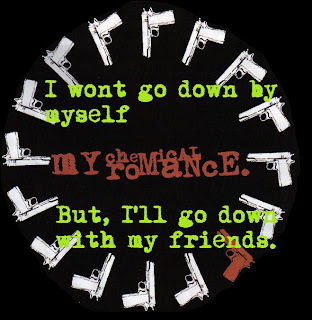 So, MyChemicalRomance.com makeover part two just blew fans' minds to hell. The new MCR.com layout is arguably more navigable than the older version of the site and features new aesthetic features as well as new functioning features. -A new photo section featuring pictures of the band in the studio on which fans can comment. 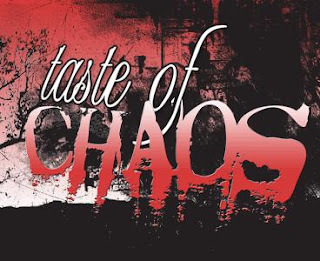 -A new background image featuring repeating "CHEMICAL ROMANCE" ("MY" actually isn't shown) in grainy, gray block letters against a black background. Alternative Press just revealed the cover of their January issue, which will feature their 'Most Anticipated Albums of 2010' list and My Chemical Romance as the cover-featured artist! According to AP, there will be 5 different collectible covers for this issue on newsstands while the full band cover is for subscribers. Who, other than MCR, do you hope to see on AP's 'most anticipated albums' list for the coming year? Pre-order any of the collectible issues here! 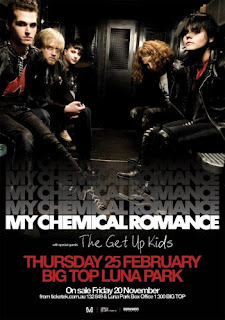 For details from this issue's My Chemical Romance article, go here. 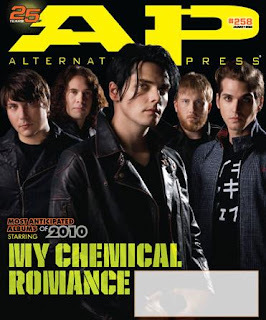 My Chemical Romance to appear on the cover Alternative Press's Upcoming 'Most Anticipated Albums of 2010' issue! 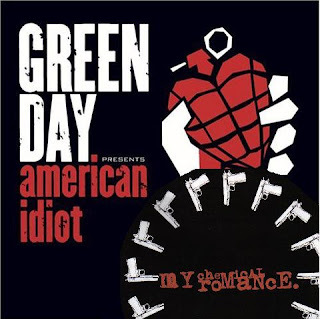 Today, Alternative Pressposted, hinting at who would be their cover artist for their annual 'Most Anticipated' issue. The hints AP posted were quotes from Anthony Green and Matt Skiba about the mystery cover artist. I remember seeing them at Warped Tour. They were playing a small side stage to small crowds, while we were playing to big crowds on the main stage. I told their singer that they were going to be humongous in a year. We made an agreement that if I was wrong, we would bring them out to support us on our next tour, and that if I was right, we would open for them. A year later, they had a platinum record and they took us out to support them on a sold-out arena tour. Mikey Way also twittered about it, making it more blatantly obvious. Keep your eyes open for AP 258! Udate: View the cover of and pre-order the magazine! 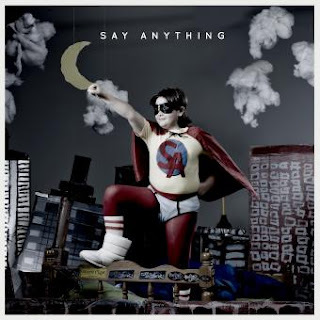 Second of my fourteen-part "Classic MCR Reviews" blog series. Written the day after the show. May 6th, 2005. As I warned last time, I was fifteen when I wrote this and edited only minor mistakes; so, there are probably many errors and things that are liable to make you raise an eyebrow. Last night, I saw Green Day and MCR in concert! Very few people were there when I got to the venue and in line. My friend and I got in quick, found our seats and sat down to wait for the show to start. As we were sitting there, we realized that -- from our seats (which were AWESOME) -- we could see backstage. Pete Wentz is set to call in to premiere Fall Out Boy's new single, "From Now On We're Enemies," on FriendsOrEnemies.Com-powered online station Rock-It Radio tomorrow at 4 P.M. EST. According to Rock-It Radio reps, "[Wentz] also has a big announcement you won't want to miss!" With the band's being on "break", I'm sure FOB fans will be ecstatic to hear from their favorite bassist. 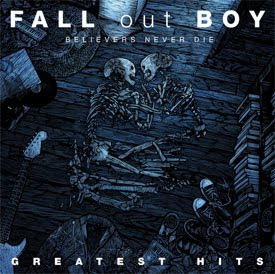 Be sure to tune in tomorrow at 4 P.M..
Fall Out Boy's "greatest hits" album Believers Never Die is set for worldwide release tomorrow (Nov 17). 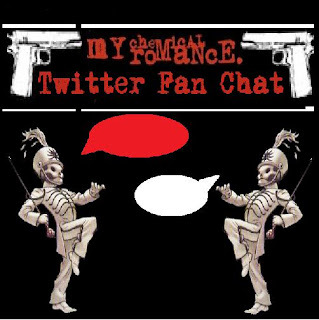 As I was snooping about today, I came across a twitter account for @MCRofficial that was being followed by one of the MyChemicalRomance.Com moderators who works for WBR. At the time I found it, there were three posts that started from November 10 and only three followers including myself. I have a feeling this is official and will be announced soon. If not, I'm just over-excited and blabbing, but it seems legitimate. Finally a full band twitter account! My Chemical Romance Clue Fans in on Material for Upcoming Album. Announce Tentative Titles and Mixing Completion of Nine Tracks! 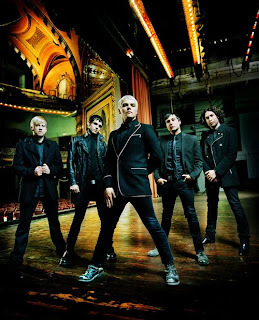 My Chemical Romance guitarist Ray Toro posted a new blog entry announcing with whom MCR are mixing their upcoming album and gave insight to a few of the nine completed tracks. Toro writes that Rich Costey, who mixed MCR's 2006 Life on the Murder Scene, is working as mixer for their upcoming album. He also notes that the mixing style and ultimate goal they and Costey have followed for this album "is to make it loud, and then make it louder then that." "very drum and bass oriented"
"mix of Judas Priest metal and 80's arena rock"
"an epic take on 'Born To Run' in 4 minutes"
Played at the Roxy. Also known by fans as "Kiss the Rain" or "LA Heavy"
Thank you to everyone who voted in my recent poll! 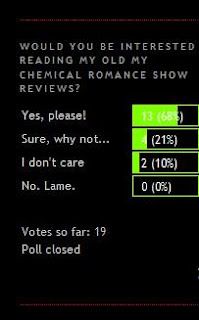 Most of you expressed interest in seeing my old My Chemical Romance show reviews. What this means is that I will start posting them in a weekly "Classics" feature. 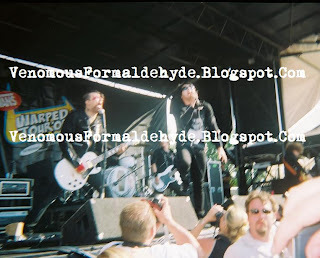 Keep your eyes open for the first one, my review of the 2005 Taste of Chaos show in Dayton, OH: my very first MCR show, next week!